Modern luxury meets boutique at this recently revamped property in the heart of the Magnificent Mile. Popular among the upwardly mobile business traveler crowd, expect superior city views, plush amenities, and tech-friendly gadgets. Among the fun property perks: a complimentary Fisker sports car service that will drop you anywhere within a 2-mile radius within the property; the new Conrad 135 program, a curated concierge program that allows you to test drive one-, three- or five-hour city experiences on a virtual headset from the Tilt at Hancock or doughnut making class at Firecakes Donuts. 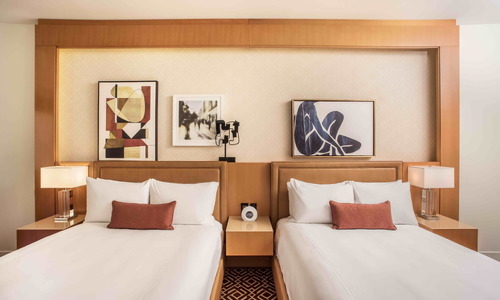 Modern, spacious accommodations feature cushy white bedding, abstract art, and comfy red couches and tables conducive to in-room working. Tech is at the forefront with touch panel controls, massive 65-inch smart televisions. No minibar, but refrigerator stocked with complimentary soft drinks and in-room Nespresso maker. Superior view city suites offer the best of Michigan Avenue. YOU SHOULD KNOW Use the Hilton smartphone app for digital key access and choice of rooms. Known for excellent service. Pets welcome with deposit and fee. Family amenities. Hilton and Chill package for families with in-room movie. 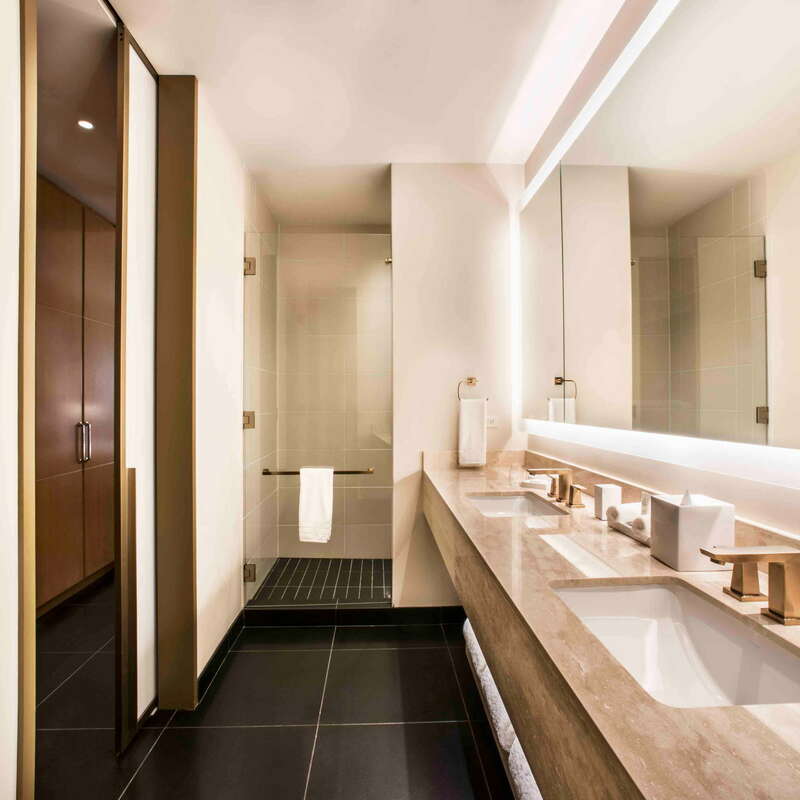 Stylish brass and marble Deco accents are among the new design features, stocked with Aromatherapy Associates products and plush terrycloth robes. 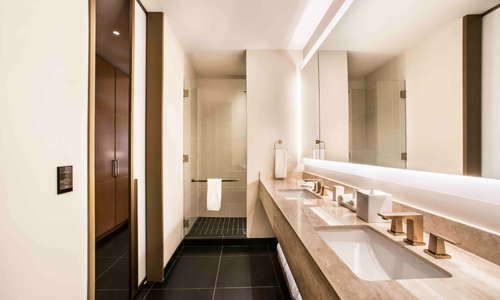 YOU SHOULD KNOW Most rooms have standing showers, but some suites have bathtub if it's a soak you're after. 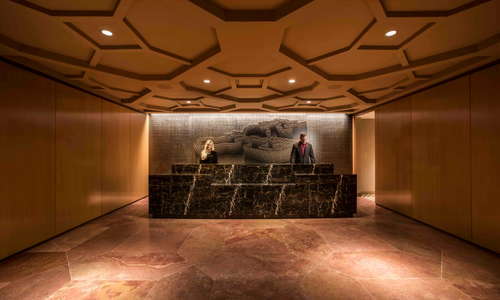 Located on the 20th floor, the property features a unique sky lobby that bypasses the rooms located on floors 8 to 18 below. 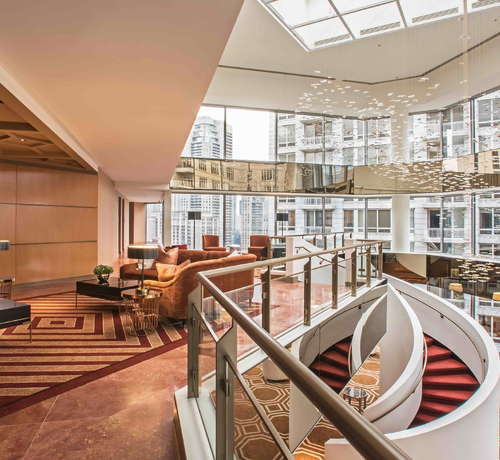 A 13-foot floor-to-ceiling glass atrium is home to a gorgeous bone china chandelier with ample seating space for catching up with emails or hosting a work meeting. YOU SHOULD KNOW Architecture nerds take note: the building's limestone facade was cut from the same quarries as the Empire State Building and Tribune Tower. Get ripped at their brand new facilities outfitted with touch screen cardio machines, TRX suspension trainers, battle ropes, and boxing bag. Internationally renowned restaurateur Richard Sandoval recently opened three restaurants on-site. Grab-and-go Italian breakfast and lunch at Il Tavolino on the ground floor, featuring an outdoor fireplace and al fresco cafe. 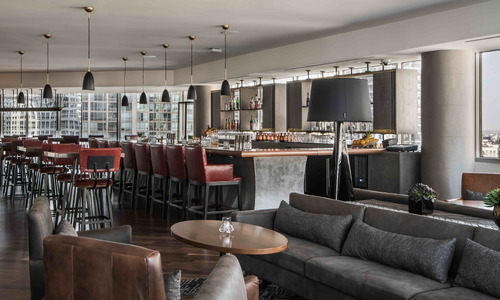 Bourbon-centric New American restaurant Baptiste & Bottle offers stunning city views and exceptional whiskey program. 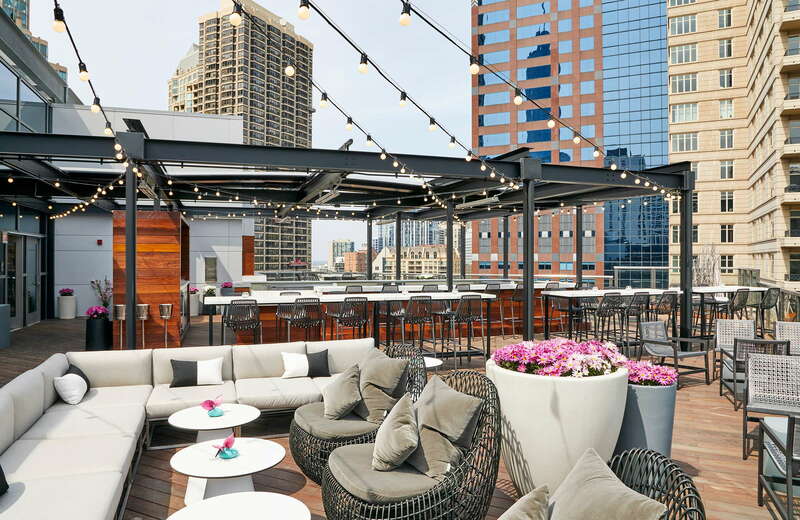 Sip on sake and chow down on sushi at seasonal Japanese rooftop, decked out with fire pits and sweeping views of Michigan Avenue. About a dozen different bus lines pick up on Michigan Avenue outside the hotel or it's a short 7-minute walk to the Grand 'L' subway stop. But the property's doorman is always able to help hail a taxi immediately in a pinch. 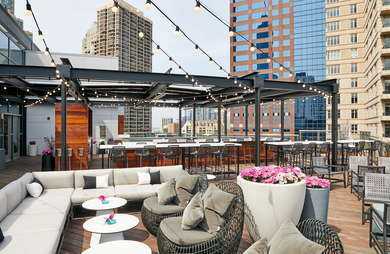 Located in the heart of River North, the property is near the city's most coveted hotspots. Take a tour of Italy at food hall and grocery Eataly (4-minute walk); try award-winning Mediterranean snout-to-tail at The Purple Pig (5-minute walk); have classic seafood supper club experience at Shaw's Crab House (8-minute walk). Pick your poison and you're likely to find something nearby: an anthology of craft beers at Howells & Hood (7-minute walk), glasses of sparkling at Pops for Champagne (5-minute walk); or tiki time at Three Dots and a Dash (11-minute walk). 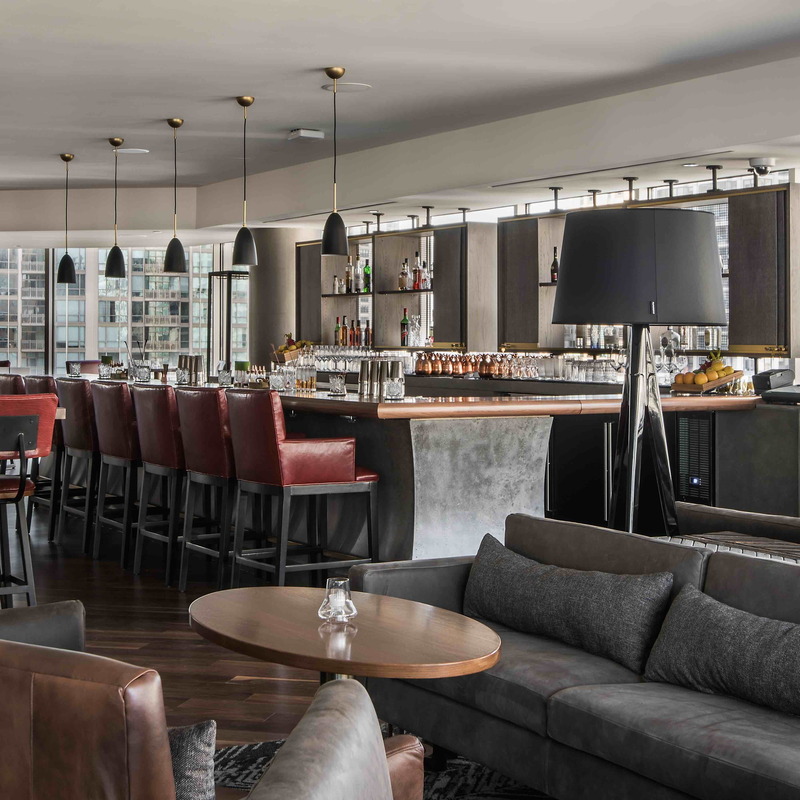 For business travelers on-the-go, it's hard to find the time to mix work with fun—which can be a real bummer in a city as vibrant as Chicago. 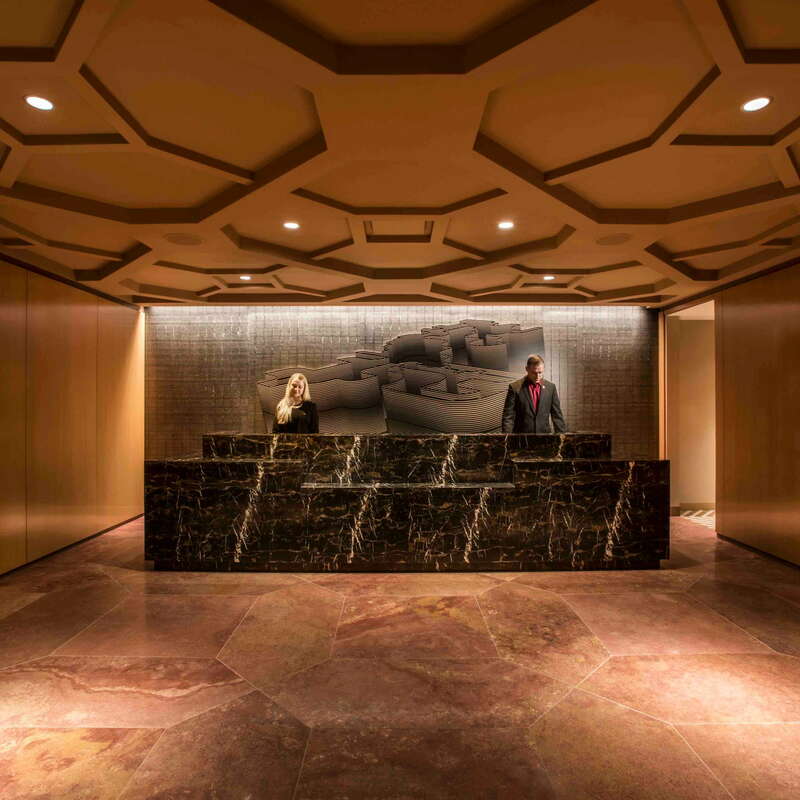 Centrally located on the Mag Mile, the property's Conrad 135 program has this kind of traveler front of mind offering curated city experiences for those who have just as little as an hour to spare. 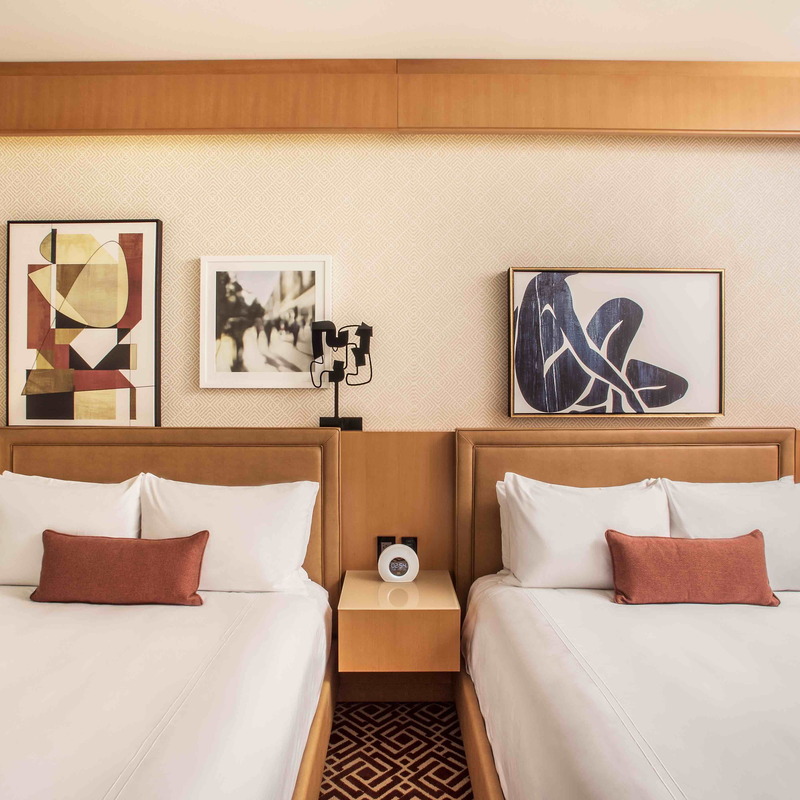 Tech-friendly accommodations make it easy to stay connected, with super quiet and comfortable bedding for a good night's rest.